A 2018 study found that a whopping 74 percent of Americans (millennials or otherwise) prioritize experiences over products. While there is no shortage of experiences to spend on, it’s hard not to associate the rising popularity of experiences with that of music festivals. In fact, forty percent of 20-29 year olds say they are interested in attending a music festival. And, since such events can cost a pretty penny it’s no surprise that festivals like Life is Beautiful, Outside Lands, and Coachella rely heavily on triggered and transactional email to keep attendees in the loop about just how much they’ve spent and to collect feedback about customers’ purchases. Check out a few examples below of how some of the leading music festivals use email to facilitate a great digital customer experience before, during, and after their respective events. You’ve just spent anywhere upwards of $600 for your festival ticket, now what? Don’t worry– Life is Beautiful has got your back. 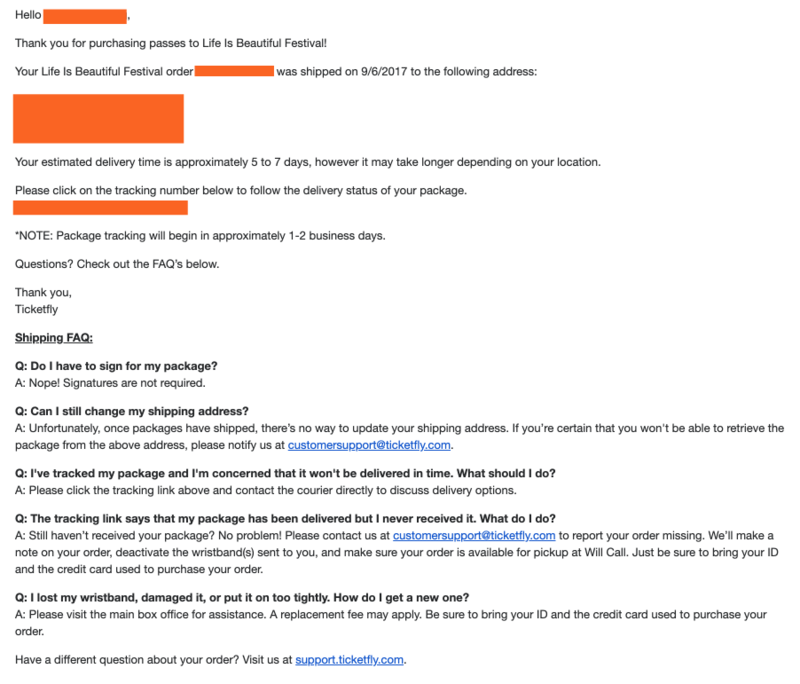 As you can see in the below example, the Life is Beautiful organizers will send you a receipt confirming your purchase letting you know when you can expect your wristband in the mail. Additionally, they provide the answers to some wristband FAQs in their email template for your convenience. There is nothing worse than making a major purchase online and having nothing to show for it. Though the memories you make at Life is Beautiful may last a lifetime, the fear of not having a receipt for your pricey ticket should not. 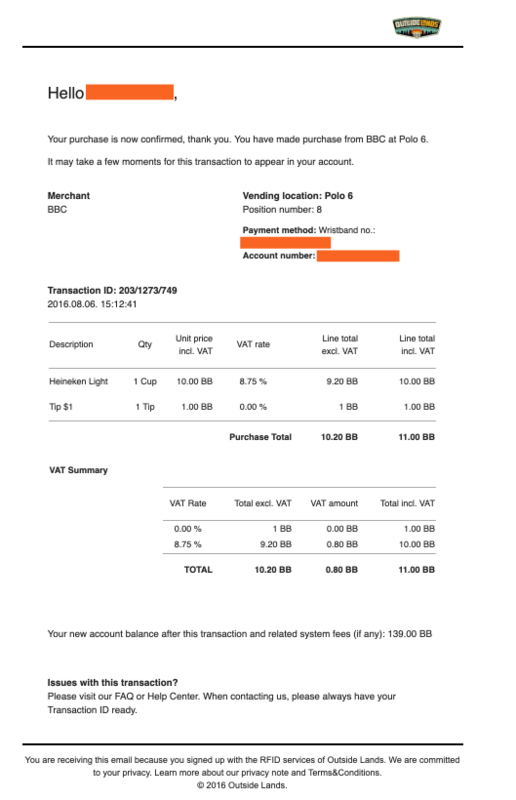 A quick transactional message letting you know your payment was received can provide a sense of reassurance that you did, in fact, purchase your ticket from a legitimate site. Like many music festivals, Outside Lands, gives festival attendees the option to load money on their wristbands rather than pay with cash or a card to keep food and beverage lines moving. While other festivals may be more opaque as to how those wristband funds can be spent, at Outside Lands every time an attendee charges an item to their wristband balance they receive a transactional email. Between the festival ticket, travel expenses and tons of other charges it is easy for festival attendees to go over budget. Outside Lands’ quick transactional emails provide a digital paper trail for attendees who want to keep close tabs on their budget and for those who might be a bit too intoxicated…by the music to crunch their spending numbers on the spot. The end of a festival doesn’t mean it’s the end of an email program. While you’re busy editing your latergrams and perfecting captions like “take me back 😭”, Coachella organizers are already at work strategizing on how to improve next year’s experience. 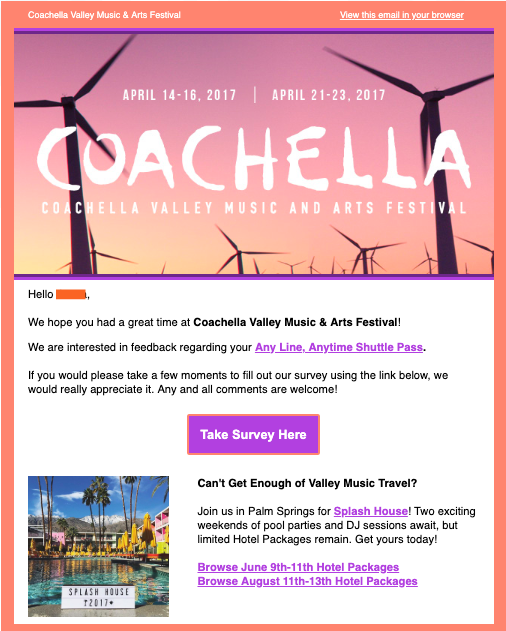 In the below example, Coachella contacted attendees who had taken a shuttle to and from the festival grounds to collect feedback about the ride. This message triggered by the close of the festival shows the ability for email to contribute to a customer’s experience even after the event is over. More than that, the message allows attendees to give their two-cents about the shuttle which will allow the event organizers to address concerns and make next year’s festival even better. While we tend to think of music festivals as memorable in-person events, triggered and transactional email serve to augment such experiences by keeping customers in the know digitally. With such a seamless customer experience to look forward to, all you have to do now is hit the mall to find that perfect pair of denim cut-offs to match your flower crown. Happy festival season! Dating Apps and Triggered Email: It’s a Match! Learn about the top 3 most effective ways brands can use celebrity endorsements in email marketing to engage with customers. One of the largest generations in history is about to move into its prime spending years. Here are 3 tips to tackle email marketing to millennials.